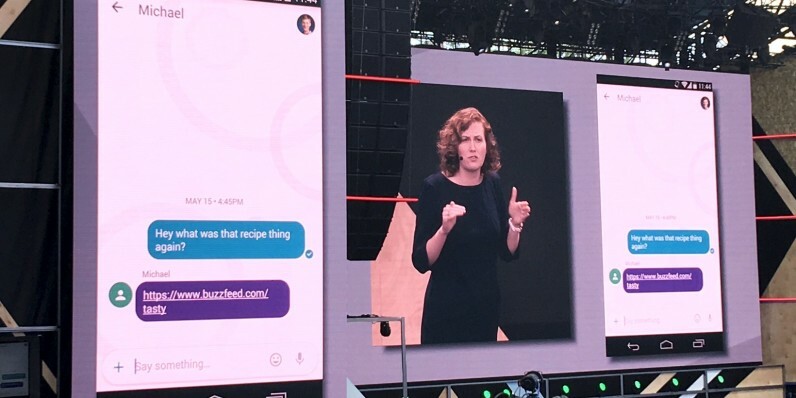 Android Instant Apps is a game-changer for the mobile Web. Announced at Google I/O today, Instant Apps lets developers take advantage of modules that allow mobile Web users to use an application without actually installing it. When clicking a link, Google Play runs the app instantly by only fetching the pieces of the app you need at that moment. The first example showed the user clicking a Buzzfeed Video link to view a recipe and being transported to the appropriate part of the application — all in a span of about two seconds. In another example, the presenter used B&H’s Android app to show a complete search to purchase cycle of a camera bag on the company’s app. No app install took place and after a total of three clicks, and about 30 seconds, the demonstrator has purchased a new camera bag. The demo was done in real-time, and on an Android device running version 4.4 KitKat. Once released, it’s expected to be backwards compatible, and will run on any device running Jellybean or newer. Google expects to roll out Android Instant Apps by the end of the year.